Please find the Preliminary Programme E-book for the 26. 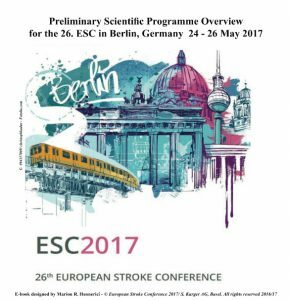 European Stroke Conference in Berlin, Germany 2017 (pre-final version 18.May 2017) including nearly all programme details and all abstracts! Please visit our website from time to time, or join us on Facebook and Twitter – we keep you informed and we are looking forward to see you in Berlin! Next story 26. ESC deutschsprachige Fortbildung am 26.5.2017 – Programmübersicht!